CPPTD lent seven TSM’s and three Leyland TD1’s to supplement the shortage of LPTB’s vehicles. Parked at the Red Deer pub, Croydon, alongside two Ford Y’s and an Austin 14, Portsmouth Corporation’s TSM (Tilling-Stevens) E60A6 is very much on foreign territory, in Surrey. At the very end of its sojourn in London, between October 1940 and March 1941, it’s part of a restful scene in an otherwise turbulent time, with the Blitz in full spate. The low-angled sunlight shows up the lining-out and city crest a treat! Also showing up is the garage/running number plate just below the front downstairs window, the empty holders of which identified many London helpers to the day they were scrapped! Note the absence of anti-blast netting on the windows. It’s on route 12 which, at the other end, reached Oxford Circus. It was probably based at Croydon Garage, a mere 100 yards from the Red Deer, both still existing, although the garage has been re-built. She got about in London, for I’ve seen a photo of her at Golders Green, too! CPPTD bought ten of these petrol-engine’d vehicles, with vee-front English Electric bodies, in 1932, numbered 78-87. Two were destroyed in 1941, in Portsmouth, the rest being withdrawn in 1944 (4) , 1946 (1) , 1947 (2) and 1948 (1). Maybe the delivery of nine Daimler CWA6’s enabled them to withdraw the first four, but, with the pressures on buses in this year on other local operators, this is surprising and mysterious. We shall never know now. All ten buses were lucky, for they were returned to Pompey on 13/14 March 1941, just after Eastney Depot was bombed on the 10th, destroying ten buses! It seems that these buses were lucky twice over, Chris. If they left Croydon Garage (TC) in March 1941, they escaped the devastating damage caused in May 1941 when the depot was hit during the Blitz and caught fire, causing a number of casualties. 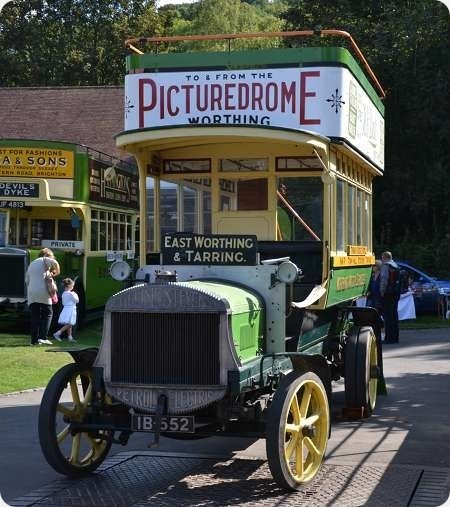 See:- www.yourlocalguardian.co.uk These TSM double deckers carried the Leyland clone style of radiator adopted in 1931 to replace the antiquated shape worn by the B10 Express. The wheelbase was 13ft. 4½ ins., and the six cylinder 6.972 litre petrol engine (apparently designed in part by Harry Ricardo) developed 109 bhp at 2500 rpm, driving through a four speed crash gearbox. Among the antiquated features carried over from earlier models was the central accelerator pedal, which some manufacturers, Crossley and Dennis being others, seemed curiously reluctant to abandon. The TSM double decker was not a success, with Walsall, Birmingham and Benfleet & District (which soon became part of Westcliff-on-Sea) among the few purchasers in addition to Portsmouth. 13ft 4½ins seems very short for the wb. though, considering 16ft for contemporary Regents et al (or around that figure anyway). What I find truly fascinating about this photo is the English Electric body! This style must beat all records when it comes to the amount of different chassis upon which it was placed, from its 1932-6 existence! I cannot think of a Thornycroft version, or, of course, a Bristol, but all the rest of the contemporary competition had examples. Please correct me if I have missed anything! That was a bad bombing, Roger. I found an associated link with a photo of the results – see http://goo.gl/giEwB. Croydon was a Tilling Garage pre-1933 and hosted many Tilling STL’s, one of which can be seen as a casualty! Thx for the additional information. I wish I knew what the TSM model codes meant; sadly, your information sheds no light on the codes. Your observation is correct, John W, about the versatile EE body. although it always seemed to grace more Leyland chassis than most others, but that may be a faulty observation! I think that you are correct, John. The wheelbase figure I gave came from a piece written by Geoff Hilditch many years ago, but I think that it might well be a misprint for 15ft 4½ins. The contemporary original 661 Regent had a wheelbase of 15ft 6½ins. Second group = Engine power (petrol) or manufacturer/no. of cylinders (diesel), which here should probably be the figure 60. Possibly this reflected the old RAC rating, which was really a measure of engine capacity rather than power. Other TSM/Tilling Stevens chassis codes were the H type, as in Dave Gladwin’s posting of the Preston’s of Ferryhill coach, and the familiar ex Altonian K type, K6LA7, in which the ‘6L’stood for 6LW and the final 7 for a wheelbase of around 17½ feet. The later, 30 ft long, full fronted lightweight Express models with four cylinder Meadows engines were coded L4MA8, the last figure denoting a 18ft 7½ins wheelbase. There was also a shorter version of the Express II, with a Perkins P6 engine, the L6PA7. The 5LW powered short wheelbase 30 seater buses ordered by the China General Omnibus Co. which were diverted in wartime to the home market, and the very similar machines bought by the China Motor Bus Co. from 1948 were coded H5LA4 and K5LA4 respectively. The wheelbase on these appears to have been about 13½ feet. Thanks for that information Roger, I’ve often wondered too because Notts & Derby had a batch of five double deckers in 1932, coded D60A6, so I imagine they would have been quite similar to the ones above, presumably petrol engines were standard at that time. Was a diesel version offered, if so, what form was it? In spite of them being regarded as not successful, some of them seem to have achieved good service lives, the Notts & Derby ones ran for thirteen years, although perhaps war was a factor in that. I have a photo of an L4MA8 coach with a Duple body which looks very similar to a Bedford SB of the time (1952). What a shame production ended just as TSM were about to enter the ‘modern’ era! Your pedantry is very welcome, Roger, and sheds some light on the somewhat arcane coding system TSM used at that time. Incidentally, I believe that TSM reverted to the Tilling-Stevens name just before the war. Even in the post-war era of distress purchasing, they did not do well, their largest orders coming from Hong Kong; 108 to China Motor Bus and 50 to Kowloon Motor Bus (K5LA7), all delivered in 1947/8. This would make the latter like the Altonian vehicle, but with a Gardner 5LW engine. One of them is preserved. I believe the Notts and Derby batch were a serious bid by TSM to gain access to the Balfour Beatty Group, where tram abandonments were mooted. The composite Weymann bodies were virtually identical to the Mansfield "Regents" of 1932, which replaced the BB tram system there. TSM never really recovered from the loss of business with the Tilling companies, with whom they shared some common ancestry, with Bristol becoming the standard "marque" after 1934. Several demonstrators had visited the Group in 1932/3, with no success. Roger, I understand that the third letter in Tilling Stevens/TSM vehicle designations stood for the location of the driving position: A denoting forward control and B denoting normal control. Hence the B9B and the B10B were normal control versions of the ‘Express’ B9A and B10A. Yes, that sounds right, Michael. I have looked through all references to TSM/Tilling Stevens/Vulcan, including goods chassis, that I can find, and the only other letter that appears is the ‘B’ that you mention. If the ‘A’ stood for ‘passenger’, the B10B would not fit the scheme, so it must, as you say, denote the driving position. At last, we seemed to have cracked the code. Kept wondering what it was that makes this rare and handsome bus look so much newer than it really is, and it’s just occurred to me: the very low radiator and bonnet line! Thanks to Chris for the posting and to Roger for the very full detail. With a spec like that, and issuing from such a respected stable, the chassis ought to have sold in good numbers, but like the Vulcan Emperor, the Morris-Commercial Dictator, the Thornycroft Daring and the pre-war Guy Arab it just seems to have faded away. Was it cost, or some unsuspected weakness…? Ian, one valuable reference source of Tilling Stevens data is the article written by "Gortonian" (Geoffrey Hilditch, of course) in the old Buses magazine in its superior days of 45 years ago, and republished in his book "Looking at Buses". He states that the double decker’s six cylinder engine, though a new design, had only a four bearing crankshaft instead of the usual seven, and the friction surfaces of the clutch were not attached to either the driving or driven plates, a feature intended to ease maintenance but which didn’t actually work out too well in practice. The chassis retained some antiquated design features and, although this TSM was an advance on its forebears, it still compared unfavourably with the Titan and Regent. As we know, the Tilling Group had lost any interest, literally and financially, in the TSM concern by this date, and the firm found it extremely difficult to gain entry to other markets in the depressed ‘thirties. The low bonnet line is certainly commendable. Some contemporary manufacturers, such as Bristol and Dennis, adopted unnecessarily high bonnet levels apparently to give an impression of power. The pre war Dennis Lance with the very high set oval radiator was possibly the most extreme example of all. The Strachans bodied Aldershot and District Lances of 1937 had tiny cab windscreens, which, coupled with the high bonnet, must have severely limited the driver’s view. Others were the Sunbeam Pathan/Sikh (the latter an early posting of mine). I’d forgotten the Vulcan Emperor, of which a few were bought by Southport Corporation, more as support for a local business than for any other reason, I suspect! I’m sure a few were bought elsewhere, but can’t recall, off-hand. You’ve got to feel sorry for folk putting in all that work, to come to naught in the end! Bad period for business, what with the Wall Street crash et al. You’re right about the low radiator/bonnet line giving the TSM a modern look: Leyland TD1/2’s of the same period looked more antiquated, with their radiator shape. Chris B and John W mention five Notts & Derby TSM D60A6’s, with Weymann bodies, delivered in 1932 and lasting until 1945. Here is an artist’s impression of one: www.cooperline.com from which it is noticeable that the radiator shell is subtly different. Nice looking vehicle, though. From photos though, I cannot discern any difference. I am currently trawling through seemingly endless internet pages to find out as much as possible about Tilling Stevens machinery. Above, in the very first comment, I say that the wheelbase of the E60A6 was 13ft.4½ins., which is patently erroneous for a 26ft. long bus. John Whitaker quite rightly challenged this figure and suggested 16ft. as being more likely. The Commercial Motor for 21 July 1931 gives the figure of 16ft.1 inch, which also fits the final ‘6’ wheelbase code. John got it right! I shall very much look forward to the information you find about Tilling-Stevens/TSM when your ‘digging about’ comes to an end, Roger. The company has always fascinated me. In the meantime, I have found a good close-up photo of sister bus No. 80 (RV1143) in the Strand, London, on Express service 12. [Copyright W J Haynes]. Me too Roger. I have always been fascinated by Tilling Stevens: Ever since our Bradford tram seaside "bungalow" was placed at Skipsea in 1948, right next to an ex-North Western single decker! You mentioned Vulcan "Emperors", another fascinating rarity. Am I correct in thinking Glasgow had the most significant number of this make and type, or was the Southport batch the largest? I am trying to collect as much info. as I can on this subject, but apart from the Southport history published by the Leyland Society, there is very little to go on. Thanks for your efforts. Between us, we seem to have cracked the post 1930 chassis designation code, and I am sure that, once I have managed to cobble together some information, our collaborative efforts will eventually unravel the details of earlier types. I am fascinated by this splendid picture, Chris. These buses must have been pretty rare subjects for the transport photographer, so every example is very welcome. What was Express Service 12? Did Portsmouth hold some express road service licences, or was this a wartime picture of an LPTB operation? I note that the front wings are painted white which might suggest the latter, but I can’t read the destination. The terminals of the old route 12 were Croydon and Hendon, though no buses operated the entire length; the route was run in overlapping sections. Did the LPTB run some express sections over established routes in wartime? Thanks for the photo, Chris H. English Electric bodywork of this era is another subject "close to my heart", and Pompey was a mecca! On the PCT theme, is it not strange that Portsmouth escaped the massive bus damage which was inflicted on so many other Luftwaffe targets? No utility trolleybuses were necessary, and only the (6?) Duple CWA6s? 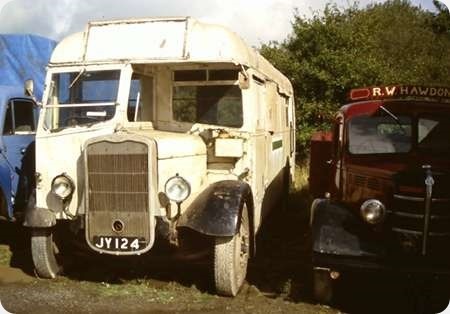 John W – Vulcan also built bus bodies and some 40 or so were ordered by Birmingham Corporation on AEC Renown Chassis in 1930 and one on a solitary Crossley Condor in 1932. I have a photo of one of the Renowns (424) with badly mangled Vulcan body which I would have assessed as a write-off, yet it was not disposed of until 1945 (Peter Gould). I also had one of a damaged Southport Vulcan somewhere, too, and an advert for them. You are welcome to use them if you wish. They also trialled an Emperor in 1930. Of course, Tilling-Stevens took over Vulcan if memory serves, didn’t they? Roger C – I notice that Birmingham Corporation took a number of T-S TTA1/2/TS3 with Tilling and LGOC bodies in 1914, then bought some more TS3’s in 1915 and bodied them with bodies taken off some pre-war Daimler chassis requisitioned by the War Dept. in 1914! They also trialled a demonstrator T-S TS3 in 1923 and a C60A6 in 1931, but it came to naught. Roger/John – Yes, the bus is in Whitehall. I can find nothing on LPTB EXPRESS route 12, save that it appeared to operate only for the duration of the loan of these vehicles, detailed above. The destination box is blank. However, looking at the original of 84 at top of page, that, too, seems to show route 12 and is taken in Croydon, but no EXPRESS label is shown. At this time the other destination was Oxford Circus. The supposition that the route was part-EXPRESS or partly so, may well be correct. The T-S in the lower photo bus worked out of Nunhead Garage, Peckham, opened, in 1911, by the National Steam Car Co Ltd, from where, ironically, bearing in mind the T-S petrol-electrics, operated another non-standard bus type, Clarkson steam buses, fired by paraffin! It’s interesting to reflect on these "also ran" manufacturers of the early 1930s. These could include the TSM E60 and related models, Thornycroft Daring, Vulcan Emperor, Morris Commercial Dictator, Gilford 163DOT, Karrier Consort and Sunbeam Sikh and Pathan. Quite possibly the pre-war Guy Arab is an "also ran" in this era of the 1930’s. None of these were effective competition against the mighty AEC Regent and Leyland Titan. Karrier and Sunbeam saved themselves by manufacturing trolleybuses instead. Would it be true to say that Daimler might have been an also ran had it not developed it’s "CO" series with Gardner engine and fluid transmission? The earlier CH and CP series had, I think, limited followings. Somewhere in between this list of also rans and the mighty Leyland and AEC were the likes of Dennis, Crossley and Bristol – the latter two having specific support (Manchester Corporation and the Tilling Group respectively) to boost their success. I agree with the contributor above that Portsmouth was a mecca for the stylish English Electric bodywork. Unfortunately the TSM’s shown had all been withdrawn long before I could be aware of their presence on the streets. Hi Chris H. Yes, I would love to see the Renown bodies by Vulcan. Also the advert! Thanks. Re. Michael`s comments about other contemporary "rarities", it is interesting to note the position of Guy in all this. I think the FC48 "Invincible" model was more of a contemporary of the "Emperor", etc. It was the mid 1930s before the "Arab" appeared, but as Michael says, it was definitely an "also ran" as were Maudslay and Foden double deck attempts during this time. Daimler were quite successful though, with the COG5, and to a lesser extent with the COG6, but mainly with the municipal fleets. Interesting thoughts Michael! Good old Bristol could hold their own though, with any competitors! According to Ken Glazier’s excellent tome on London Buses during the Second World War (a book now itself twenty-seven years old), the Express 12 followed the normal 12 but ran limited stop between Dulwich and Trafalgar Square. This operation started on 24th October 1940 and ended after 18th March 1941. The main purpose of these services seems to have been to get people home as early as possible, before the combined effects of the blackout and blitz extended their journey too much. By the following spring the urgency was reduced and the change of focus by the Luftwaffe meant that by the following winter these measures were not needed. They had not, in any case, proved very popular. Thx, David B, for filling in the gap. Although nothing can be read into it, it would seem that this bus was not popular, since it appears to be empty! Thanks, John W, for your comment (on 9th). I agree that the Guy equivalent of the Vulcan Empreror would have been the Guy FC, which was named the Invincible later in it’s production career. The FD Arab came on the scene in 1933, and was more contemporary with the Morris Commercial Dictator offering. I had forgotten Maudslay – was their offering called the Meteor? Memory tells me that Foden only produced one (perhaps two double deckers pre-1939. One was registered AMB 834, and had a body with a very sloping front profile in a straight line from upper deck top window right down to the front mudguard. I think it worked for a Cheshire or North Wales independent. I can’t trace the books I need to check these items, so apologies if my memory is faulty – no doubt you good folk out there will add your own memories and facts as needed. The fates of the other two Foden ‘deckers seem to be more elusive to researchers. Michael. The only pre war Foden I can bring to mind was the one supplied to Ebor, of Mansfield. This had a sloping front right down to the base. Not sure exactly when it was delivered, or who bodied it.Maybe Burlingham? Coventry referred to their Maudslay double deckers, from 1929 to 1931, as "Magna", I believe, including both 4 and 6 wheel versions. I have also seen reference to them described as "Mentor", so hope someone can clarify. Thanks for the "Arab" clarification. I think the first one was for West Riding, with a Roe CE body, but have always thought that the "Arab" was simply a Gardner engined development of the FC. Certainly, its chassis "geometry" is in line with the FC , being much more a relic of the TD1 era. Would n`t it be nice if we could bring all this detail from all these 1929/32 attempts at AEC/Leyland competition together in one document! Guy double deckers always seemed to be rare in the 1930’s although Cheltenham District bought some (were they called Invincibles?). Another company was Albion which built the Venturer (1932-39 and CX (1937-39), which did not really penetrate south of the Border very much between the wars and not that much in Scotland to my knowledge. Glasgow had some, but also bought Leylands and AEC’s quantity (ever pervasive!). Dundee – NIL. Aberdeen – ?. Scotland never seemed so supportive of Albion as many North Country municipalities were to firms like Crossley and the like in that era. Yet they were sound and reliable vehicles to be trusted. FWIW, David B, I came across another EXPRESS route which ran for a slightly shorter period: 7/11/40-19/3/41 – same reason given. This was the 47, running from London Bridge, stopping only at Lewisham, Catford, Bromley (Market Place), then all stops to Bromley Garage. Following on from my posting of 9/12/13, I’ve found details of TS models, with dates into service, which might fill in more blanks: 1924 – TS5X and TS3A, 1925 – TS6, 1926 – TS5A, 1927/1928 – TS6, 1928 & 1931, both T-S and TSM B10A2. OOps! – In my list of "also rans" for double-decker chassis manufacturers, I mentioned Morris Commercial. I wrongly noted the Dictator, which was a single-deck chassis. The d/d equivalent was the Imperial. This was sold to Birmingham and East Kent (and I think Edinburgh, too?). Also my thanks to Roger Cox for linking my description of the Foden to the bus I had in mind – the Burlingham bodied example owned by Ebor of Mansfield. (Now another digression – Ebor is the Latin name for York – is this a co- incidental use of the fleetname, or is there a specific connection between the Ebor of Mansfield bus company and the city of York?). It would appear that Ebor, besides being the ecclesiastical title of the Archbishop of York, was also the name of a famous nineteenth century racehorse. Perhaps the diocese should submit an entrant to the London Marathon. This link www.ourmansfieldandarea.org.uk/ gives a bit of information about the Ebor Bus Company, but it contains no indication about the origin of the name. The Roman town was actually called Eboracum, not just the Bishop! This shuffled into Jorvik (as in the heritage centre) with the Danish invasion and then this gradually became York. Similarly Danum Corporation Transport (the Crimson Lake chariots)- all right, Doncaster. The Portsmouth Corporation Tilling Stevens seen on the Red Deer forecourt in South Croydon was photographed between October 1940 and February 1941. The row of houses behind the bus, and the school behind the houses were flattened when a bomb fell on the school on 5th February 1941. About 100 yards to the left, the South Croydon bus garage was bombed on 10th May 1941, destroying the building and 65 buses which had been refuelled ready for the next morning. Seven men were killed in the explosion. The most Vulcan Emperors amassed by anybody were the 25 the Glasgow Corporation transport ran. Vulcan itself was bankrupt by 1934. The liquidators sold the name to TSM. As for the 1933-40 Guy Arab Robin Hannay has some detail about it it the current (August-September 2015) number of Classic Bus; in it he also mentions the solitary Sunbeam DF1. Also Ebor bus Company of Mansfield were connected with Ebor general Stores of York. The Ebor Bus Company was an offshoot of Ebor Trading Ltd. of Walmgate in York. Part of their business involved financing vehicle purchases for various operators, one of which was Rudolph Twaites of Lockton, near Pickering, who ran buses into York from Pickering and Malton. Mr Twaites possible over-stretched his finances and the vehicles and business passed to Ebor Trading in 1929. This business became the Ebor Bus Company. Possibly the Mansfield business was acquired in a similar fashion. The York Operations were sold to West Yorkshire Road Car Company in 1930. I have no knowledge of buses but have got a photograph of a Tilling-Stevens bus which is being loaded at Folkestone Harbour. The reg date is about 1921 and bus is a petrol electric double decker, and looks very new. My interest is in researching and building a model of the Folkestone Harbour railway. There are a number of possibilities of why a bus was being loaded onto a ferry steamer for France. A return of a bus from France after WW1 is discounted as none were shipped out. The best that I can offer is that holidays by coaches to France were being offered via Dover, and Folkestone was trying out a new steam crane to load the bus. A very good picture of one of these TSM double deckers in wartime service with London Transport may be found on the following page (scroll down a bit):- www.hampsteadheath.net/bus-slides.html Click on the picture for a larger view. Thx for posting the link of 82, Roger. This is the photo that I mentioned in the second paragraph in my initial blurb, taken at Golders Green. As an aside, I said that seven TSM’s and three Leyland TD1’s were lent to London Transport at that time, Ironically, we’ve seen three photos of the former, yet I’ve seen none of the latter! I’m joining this dialogue at a late stage (7/18). I ived in Paulsgrove as a lad and remember changing at Hilsea Lido on the way home to the 21. It always struck me as a powerful vehicle especially when conducting a hill start with a full load in Paulsgrove. There were two buses scheduled for the 21 nearly always CWA6’s. As a small boy in the late 1940’s I remember the original bodies as they had wooden slatted seats. They operated on the then J/K route between Highbury and Wymering. Later in life I spent a short time as a Southdown driver operating out of the Hilsea garage. Thanks for your comment, Terry. Here’s a post I did some time ago about the re-bodied Daimler CWA6’s http://www.old-bus-photos.co.uk/?p=5211. I lived in Pompey from 1956-1976, but missed seeing the original Duple-bodied ones as I was in the RAF from 1956-1959 and it was in 1959 that they were re-bodied. The corporation were late to have them re-bodied, being lucky to have their utility vehicles bodied by Duple, who probably built the best quality bodies from a hotch-potch of steel and green wood. On one occasion they rejected a delivery of this wood as being virtually unworkable, a close-to treasonable act during WWII! London Transport, who still had some clout during the war, managed to take delivery of all 281 of its Daimler CWA/CWD6’s bodied by Duple and even persuaded the Ministry of War TRansport to have Duple build a lowbridge version of their body, too. PHotos of Portsmouth’s Duple-bodied Daimlers are very rare and have eluded me so far, but I did see a photo of the rear of one of them in North End Garage and was surprised to note that rear blind boxes had been installed in them, possibly the only case where this was done. Riding in them for me was a depressing experience. With only 9 buses with pre-selective gearboxes in the fleet, the drivers used to abuse the gearboxes terribly and it’s to the credit of the makers and corporation fitters that they kept going for so long. Chris, the Pompey Daimler utilities were re-bodied in 1955, not 1959. That explains why you saw none of them in their original condition! It has become a recent myth to give the 1959 date, I don’t know it’s origin, but the true date is 1955. They then lasted until 1965, being replaced by the final nine MCCW-bodied Leyland PDR1/1s (246-254 with ERV-D registrations). Some of those Atlanteans (5 of the 9) were converted to open-toppers, renumbered 7-11, and I think some survive today. That makes a vague link back to those Daimlers in a way, and looking at a fleet history, the Daimlers will have replaced some of the TSM E60A6s at the head, so we can connect the whole thread! I originally put 1955 in my other blurb, but didn’t look at it to refresh my memory and must have fallen for a later mention of 1959, which neatly, but inaccurately fell into line with my RAF service! I’m thinking that Route 21 was originally route J/K, or is that rubbish, too, Michael? Have you ever seen a photo of the Duple-bodied buses? Mention of my RAF service has just brought to my mind how awkward I used to feel on the few occasions I had to come home to Pompey and be the lone figure in blue/grey amid a sea (pun!) of uniformed matelots! Unusually for Portsmouth Corporation at the time, route 21 (Hilsea – Paulsgrove) was bi directional. Once route 3-4 was converted from trolley to diesel, it was extended from Cosham to Paulsgrove and replaced route 21. Route J-K began some time before 21. It was later re-designated 23-24. Part of a caption on page 97 of Bob Rowe’s ‘Portsmouth Corporation Transport’ states "Space does not permit an explanation of the rather complicated history of these two services (J & K respectively) which strictly speaking were not a pair." I was born in, and grew up, in Portsmouth, but the area served by J-K was uncharted territory for me. A classmate told me that the service was difficult to understand unless you travelled on it. Maybe Mr. Hebbron or others are able to elucidate. Hi Chris, unfortunately the erroneous 1959 date is now in print, in the Portsmouth Corporation Transport Super Prestige Series (No. 26) – a photo caption on p.60 has it as a given date. I must have seen the Daimlers with Duple bodies in action, as they seem to have been used on the J/K service, which wasn’t far from where I lived. But I don’t recall them, and the photos I have seen are in books such as the one I’ve just mentioned. Service 21 was a completely new route, started as a feeder from a developing part of Paulsgrove housing estate to Hilsea Lido, where passengers could then change to other service into town. 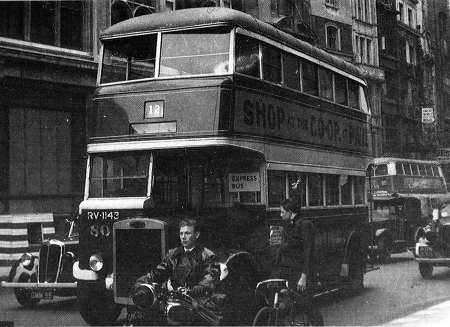 In 1955, it was the first numeric bus service for many years (c.1927) – all other motor bus routes were lettered. It was also the first to be numbered the same for both directions rather than paired as, say, 21/22. 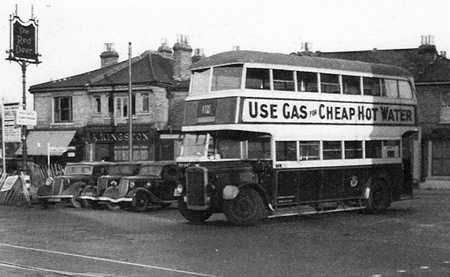 Towards the end of 1960, it became part of route 3/4 (Cosham to South Parade Pier), which was converted to motor bus from trolleybus, and extended from Cosham to Hillsley Road. The J/K service was entirely separate (apart from some common roads in Cosham), and my memory says it started in war-time, although it had it’s origins in a private service from the Highbury Estate to Cosham. When the Corporation decided to rid themselves of lettered bus routes, it became 23/24, in c. 1961/62. At about that time, I was in Combined Cadet Force at school, and opted for the RAF – so you weren’t the only one flying the colours! This site, which has many illustrated fleet histories and fleet lists, is run by a group of transport enthusiasts with past and present associations with the psv industry. The secretary is Peter Gould, and the LTHL project entirely replaces, updates and improves Peter’s former bus operator listings, which are now redundant. This important transport reference resource is well worth a visit, and LTHL has now added a link to OBP. Thx, Roger, for the heads-up on LTHL. I shall enjoy reading the intriguing T-S story PDF Booklet and make a donation to support this effort.